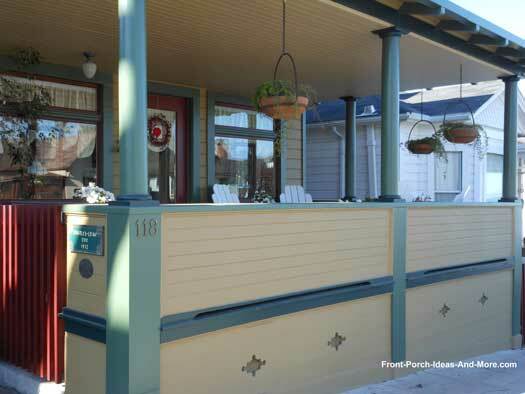 There's no denying that front porch railings not only provide safety but also will give your porch some real pizzazz! 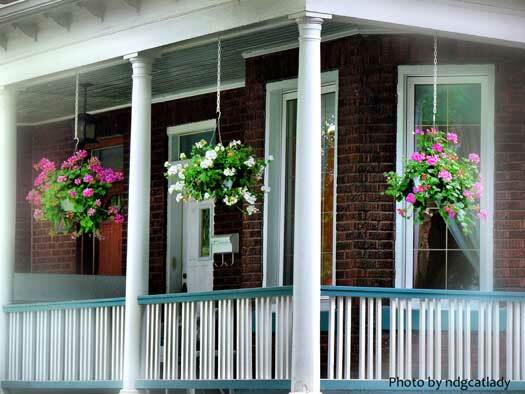 Even if not required by your local building codes, railings add charm and curb appeal. 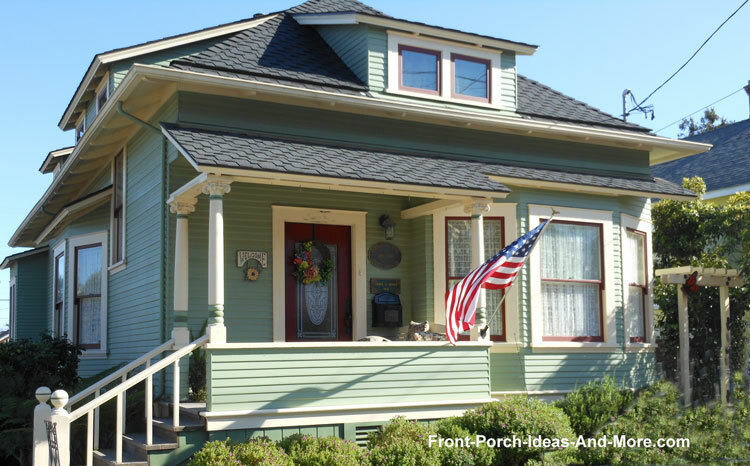 Like many components of your porch, you have many porch railing design choices. 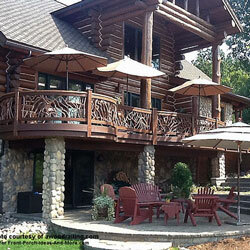 Choose to create a balustrade to reflect the architectural style of your home while incorporating your own desires. 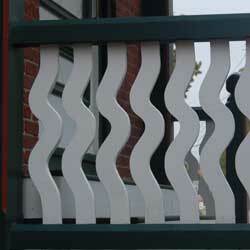 These are turned porch railings. Attractive, do you agree? 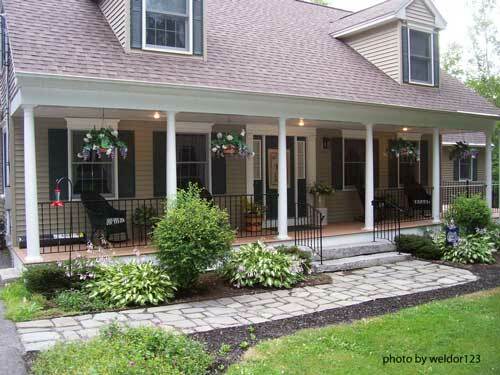 Updating or even replacing porch railings is an easy way to change the look of your home. Fortunately, you have many options and some are maintenance free. 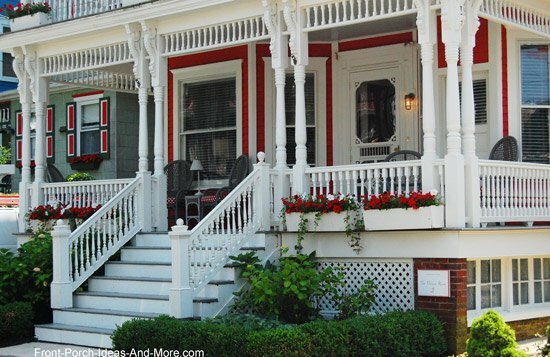 Do you like these turned balusters on this Cape May NJ front porch? 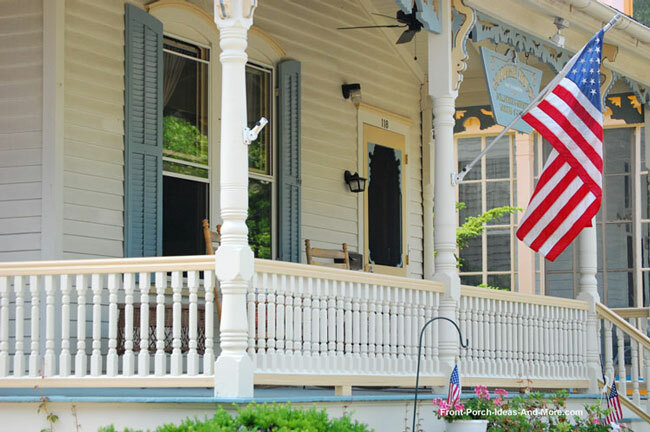 Whether your front railings are wooden, metal, glass or composites, find the right look for your personal tastes. 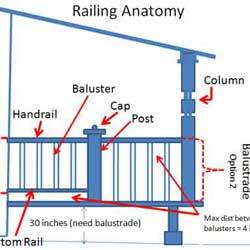 Use our Design Center Guide below to plan your porch railing system, normally called a balustrade. Most home supply stores will carry the basic top and bottom rails with a choice of a few traditional spindles. Or, you can find more custom designs at manufacturers like Vintage Woodworks. Often times; however, you may need to make the railings yourself or hire a contractor to cut and assemble the balustrade. 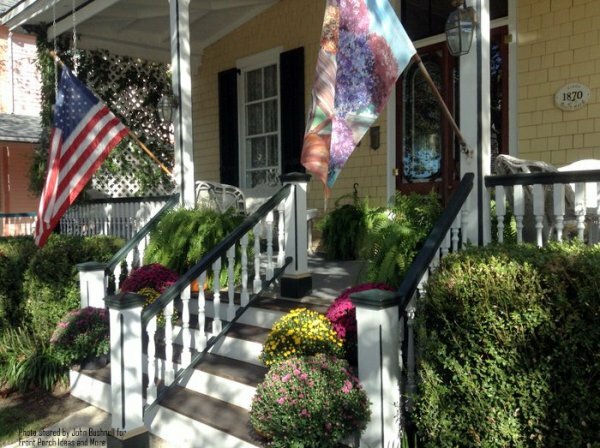 Whatever path you choose, our guide should help you select the best railing design for your home. 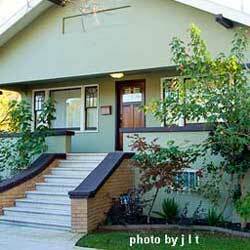 NOTE: Your railings must comply with local building codes and different locales have varying requirements. The examples we show may or may not be in compliance with codes for your own local area; be sure to check with your local building codes department before installing railings. 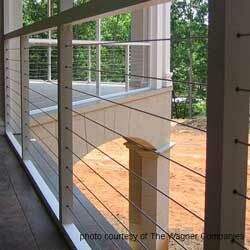 Check out our porch railing spacing and calculations guide for additional information. 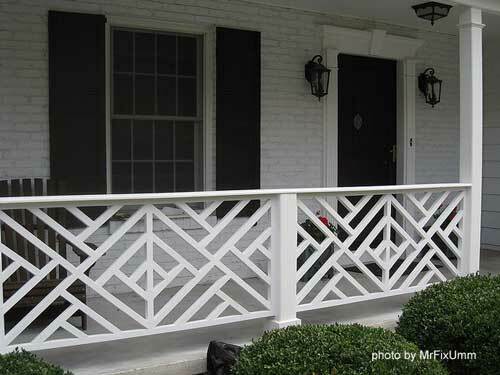 Custom vinyl lattice is an affordable and decorative way to create a unique railing system. 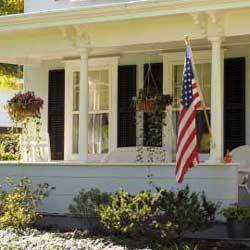 To learn basic code requirements before you build or plan for your porch railings. 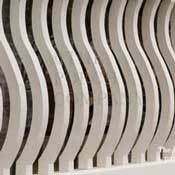 Use to install or build railings. We've got just the information you need to make the job easier! 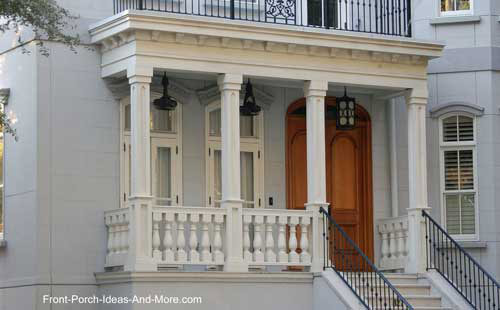 Wood balusters offer design options you may not have previously considered. 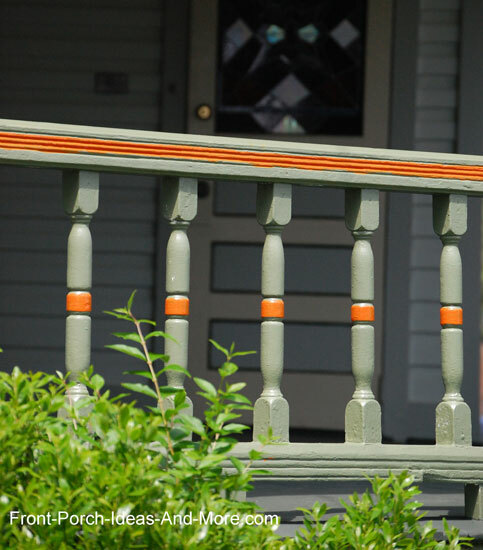 Sawn porch balusters are amazingly decorative. 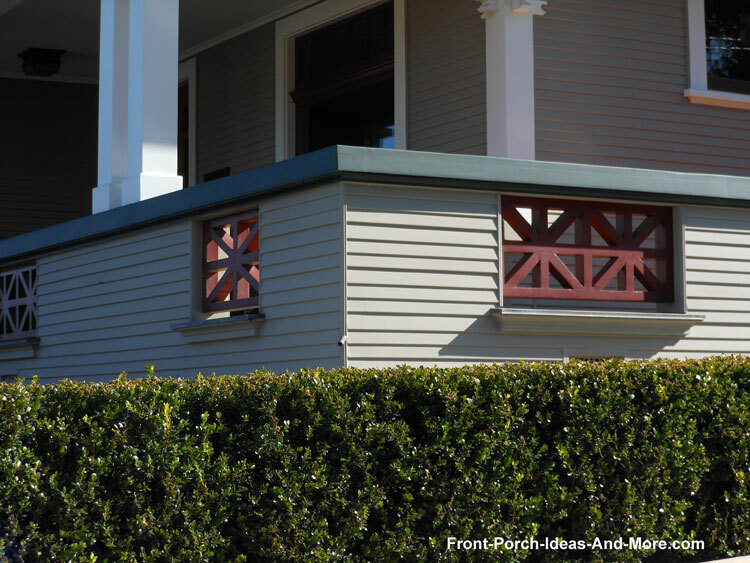 Use with or without other porch trim to create a work of art on your porch. Glass brings a touch of elegance and offers you a most unrestricted view. Check out what you won't see. To find just the right material - you'll be pleasantly surprised at your options. 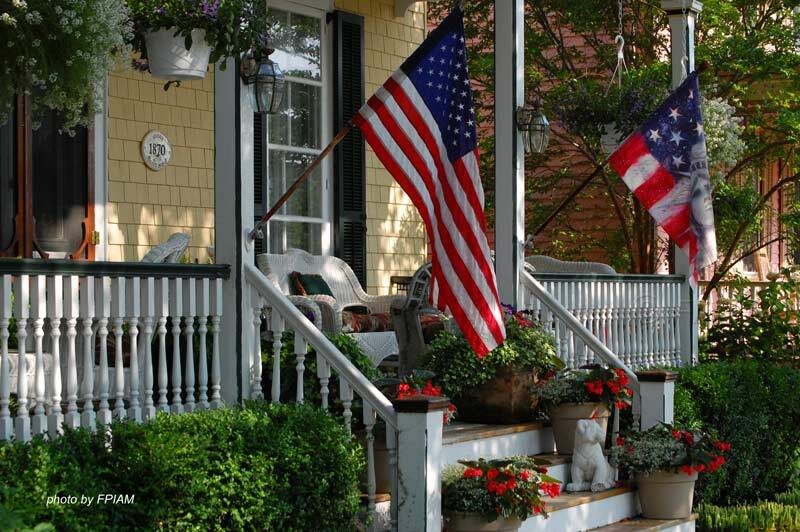 See your options for porch hand rails and materials - great photo examples too. 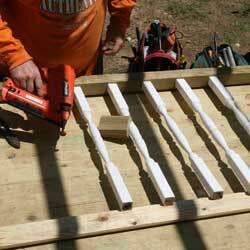 See DIY Railing Systems. Selecting the right material, knowing the railing codes, and understanding how to calculate and space your balusters are all part of your balustrade system. 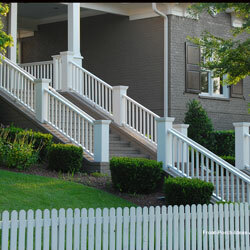 We have all that information and more to help you design the perfect railings for your home! 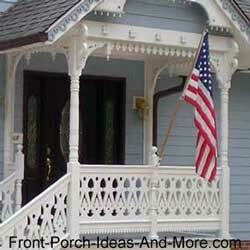 Lovely porch railings and trim like the above is from Vintage Woodworks. Classic, timeless and charming! Knee Walls - Have You Heard of Them? Knee walls, once very popular, still have their charm today. Look at the pictures below for examples. I grew up on a porch with a knee wall and spent many hours playing games, hide and seek, and just pretending. 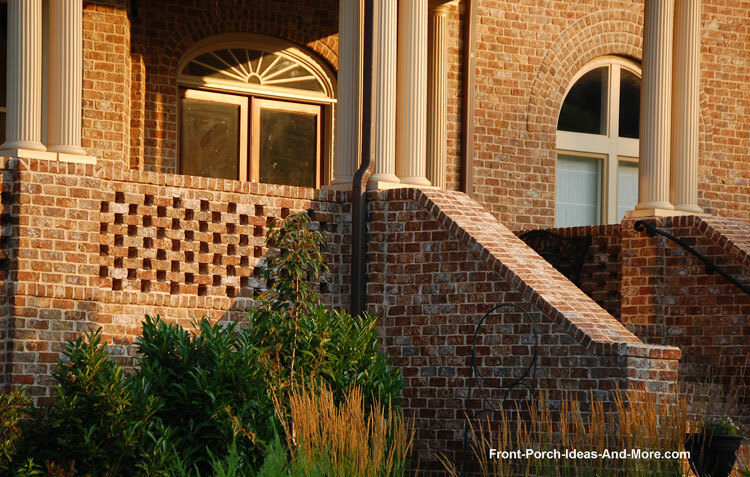 Knee walls can help protect you from adverse weather, add a little privacy, and make your porch appear more grand. Photos above by J L T, FL Architect Fan and bob2006. Take a gander at these impressive knee walls we found in California. I especially like the last one that incorporates a baluster-type design within the knee wall. 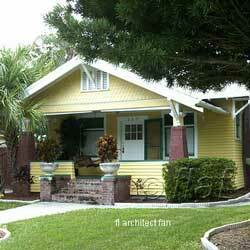 Excellent example of coordinating the colors of the porch columns to the kneewall. Do you see? 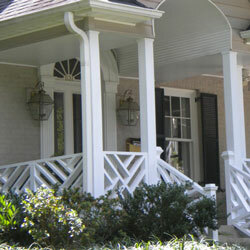 How About Wrought Iron or Metal Porch Railings? Although it is one of the most expensive railings available, wrought iron stands the test of time. 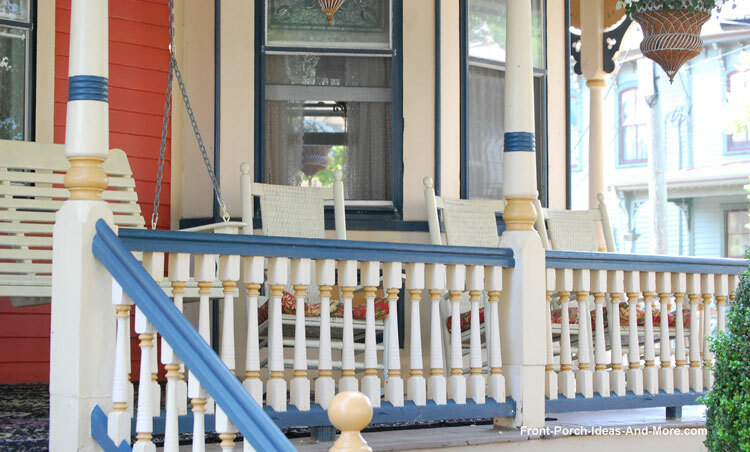 From the simplest designs to the most elegant, wrought iron always adds character to any porch. They are decorative by nature, you can attach ornaments such as family crests, leaves, and other designs to enhance the overall appeal like the one shown below. 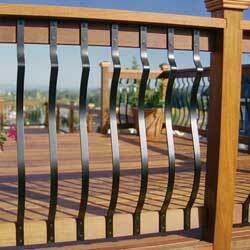 One drawback may be that wrought iron tends to rust over time and therefore requires periodic maintenance. 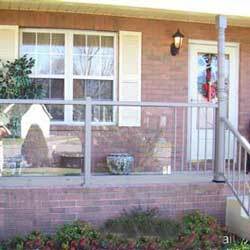 However, other metal railings like aluminum offer a similar look and may not require as much care. 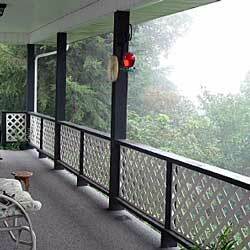 These metal porch (or deck) railings come in 6 foot lengths making them easy to install. They are maintenance free and can be used with existing columns and posts. Another option is to purchase custom made railings; use our handy Find a Local Contractor form to locate a supplier in your area. 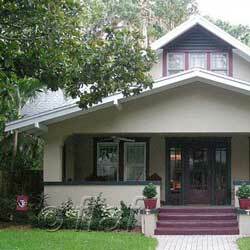 Generally, you will want to match the architecture of your home. 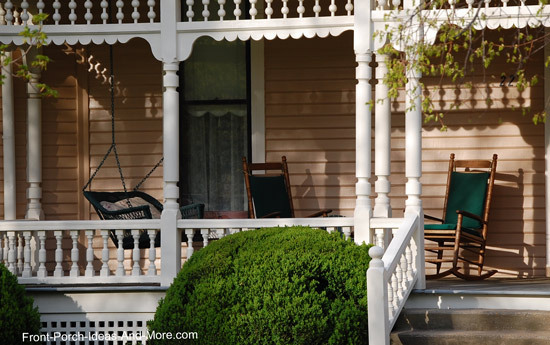 Victorian-style homes usually have ornate balustrades like shown below whereas a country porch normally reflects a simpler design. But don't always hold to convention. 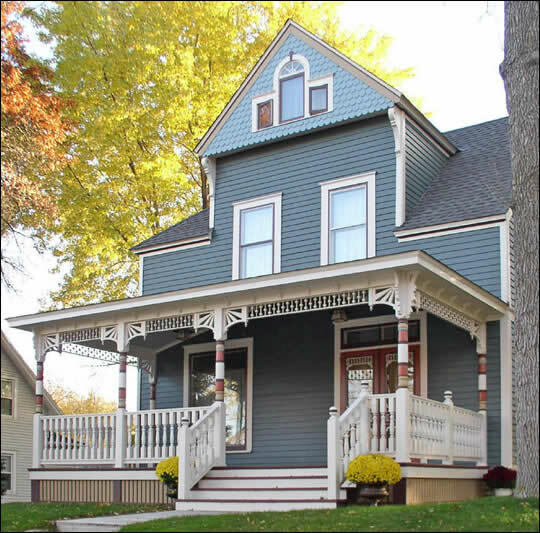 Here's an excellent example of a Victorian design with unassuming square balusters. How beautiful is that! 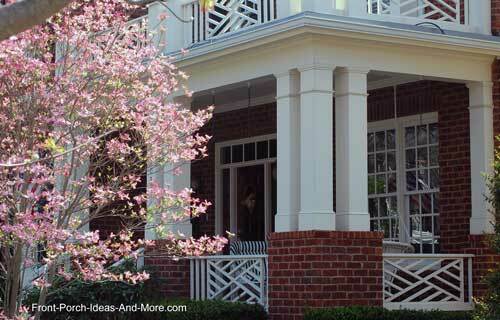 Brick homes tend to appear symmetrical and many homeowners want to add a little charm. 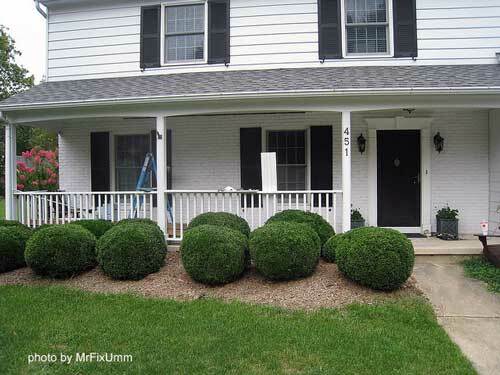 Use a railing design to soften the overall appearance of your home to give it a more comfortable look. In the photos below, the same herringbone-type design was selected for each. This design not only adds charm but also interest as well. 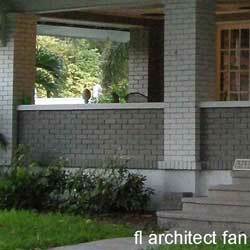 See how well it works on two different brick porches. Consider the height of each baluster (picket). 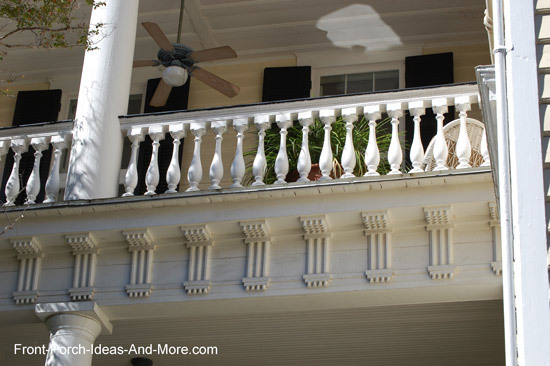 Normally, your balustrade is a minimum of 36 inches making your balusters approximately 32 inches. 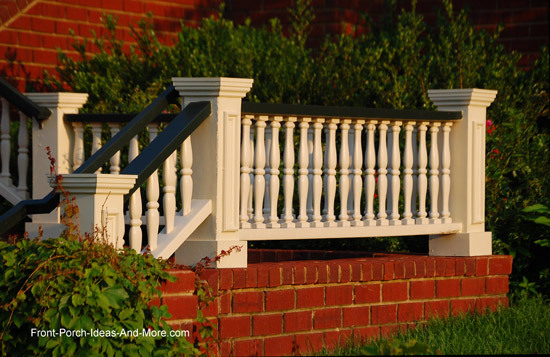 Depending on the height of your porch or deck from the ground, balustrades may need to be as high as 42 inches or more. However, and depending on your local codes, you may have other options. You can almost always make them longer and sometimes can shorten them as illustrated in the photo below. You can opt to use turned balusters that are fairly thin in width or choose more substantially looking balusters. This range of size options will also affect the overall appeal. 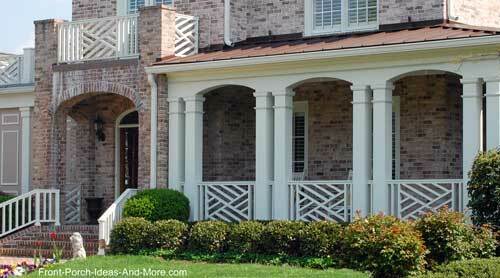 It is important to match the size of your balusters to your porch columns (in most cases). 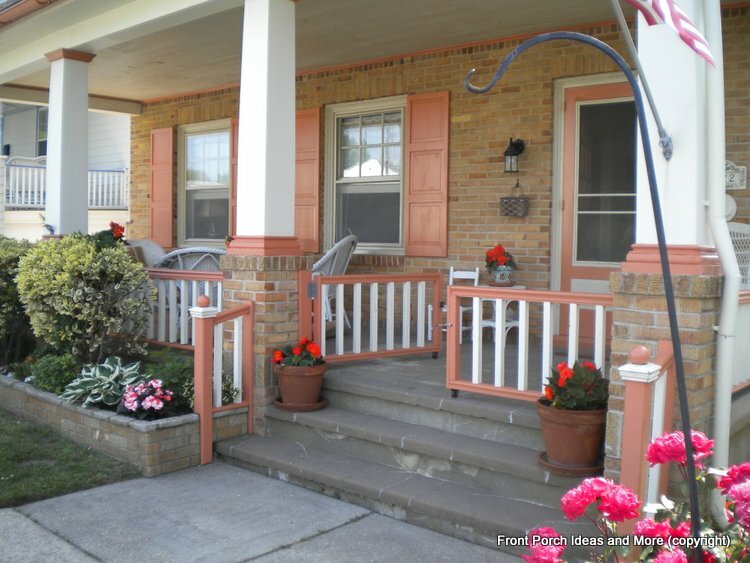 Note how the larger porch balusters complement the size of their adjacent porch columns. The spacing of balusters also impacts the overall design affect. There are no hard and fast rules so experiment to discover what pleases you the most. Be different! 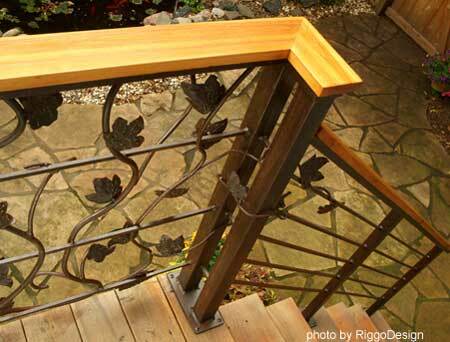 Don't be afraid to mix and match railing designs. 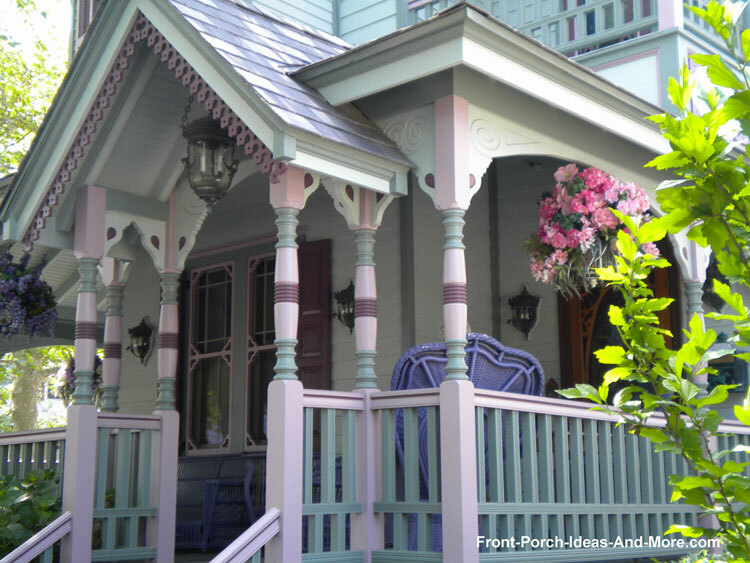 In the photo above you see both horizontal and vertical railings combined to make a most charming porch. Safety is an issue (and is the major reason for having a railing system). 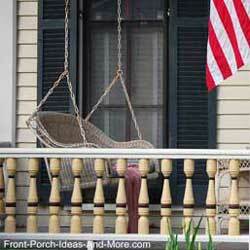 If you have small children that play on the porch, opt for spindles that can take some punishment and not break. Choose hardwoods, vinyl, or metal. Railing design becomes a safety issue as well. Although horizontal balusters satisfy most building codes, I don't recommend them on porches with children. They make great "ladders" which could prove harmful to small children. Select a material that best suits your needs. 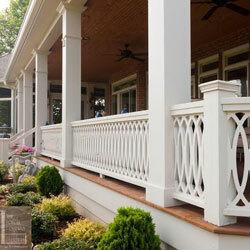 Metal and vinyl railings require very little maintenance and last forever. Wood, although it requires routine maintenance, can be beautiful and should be used if maintaining architectural integrity is important. 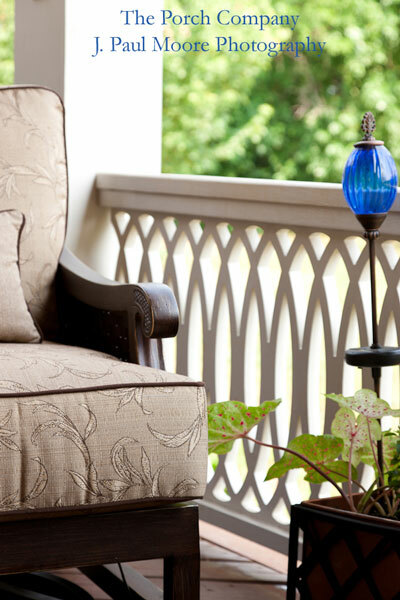 Panels of tempered glass or cable look fantastic on contemporary porches and allow an uninhibited view. 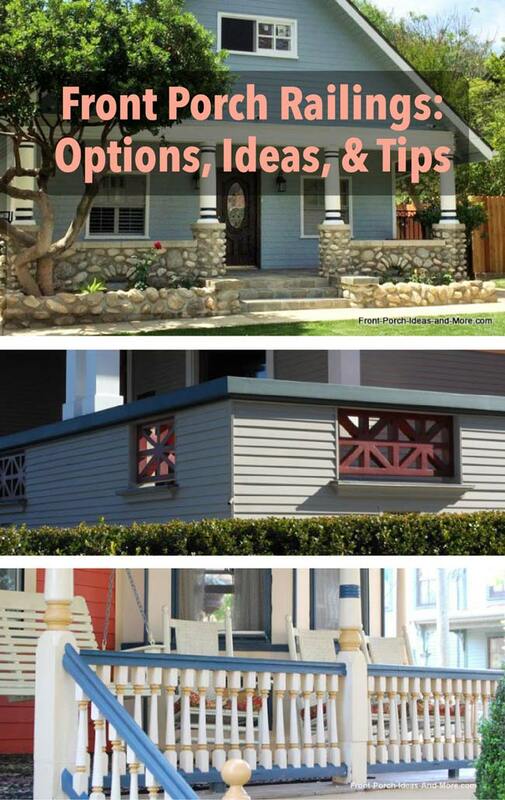 What About Gate Designs for Your Porch? 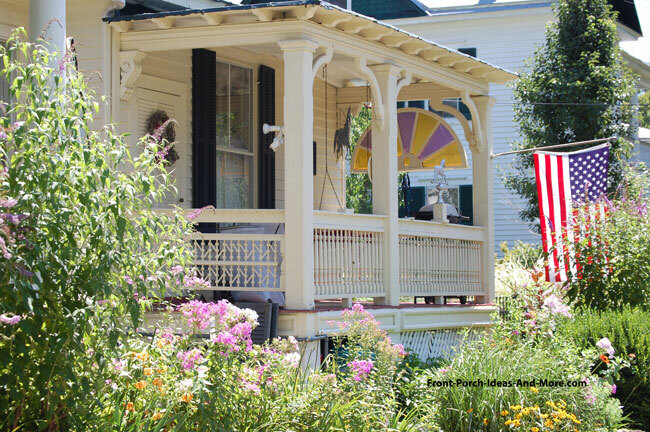 Do you have small children who like to play on the porch? Or pets you want to keep safe? 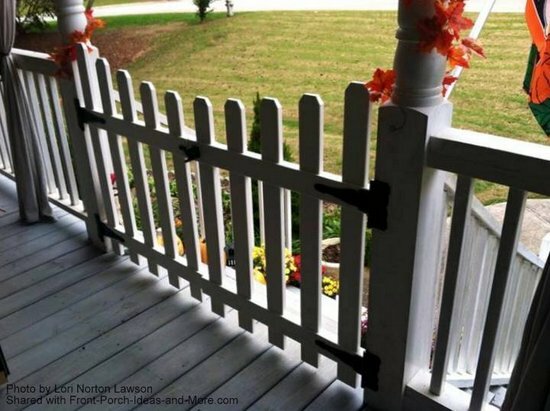 You can easily make a rolling gate from a section of railings that match your porch. Watch the video above for an example that our son's family did. Just add hinges to it and rolling casters at the bottom. Then close with a latch. 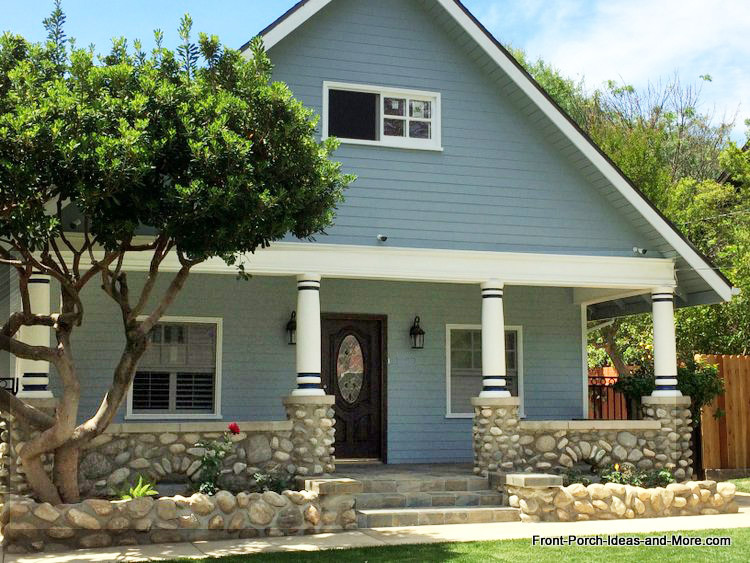 Lori and her husband were looking for a lightweight gate that wouldn't sag on her porch. She had the idea of purchasing a vinyl fence panel, cutting it, then attaching hinges and a latch. The panel they purchased had to be assembled. They removed two pickets because they needed a smaller size. Her husband used a circular saw to cut the vinyl - which she said took just a few minutes. He pre-drilled the holes on the wooden porch columns and they had it up and together in probably an hour. Their gate keeps their dogs and cat on the porch and it looks very attractive, too. 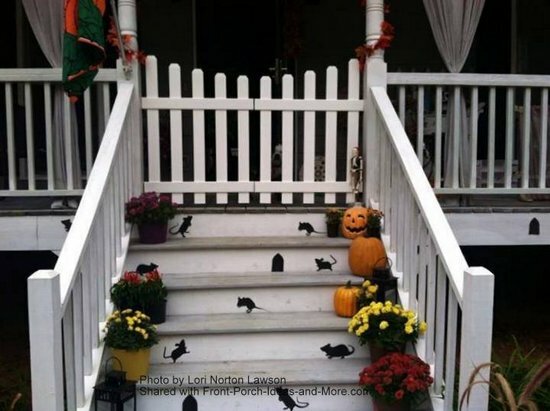 Do you have other ideas for a gate on your porch? Please share with us. Here's a close-up of Lori's gate from inside her porch. 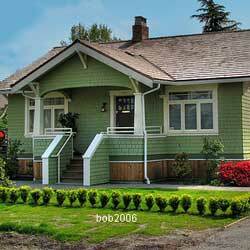 The hinges and latches are attractive and the gate style adds interest to her railings. Lori says the gate is so lightweight that there is no need for wheels. 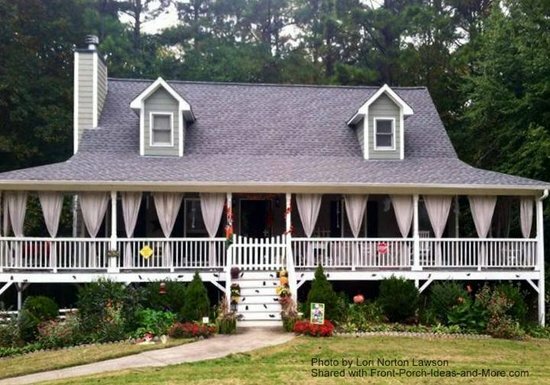 Lori's home has a beautiful wraparound porch and the gate looks terrific. 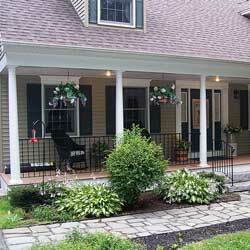 Porch railings can also offer privacy or protection from the wind. Mary and I found this neat idea that could be an answer for many. Whether you need a little privacy from neighbors or just want to hide an unsightly shed or old car, using these railing privacy screens should do the trick. Easy to install, they also offer protection from the wind while being an attractive addition to your porch, balcony, or back deck. 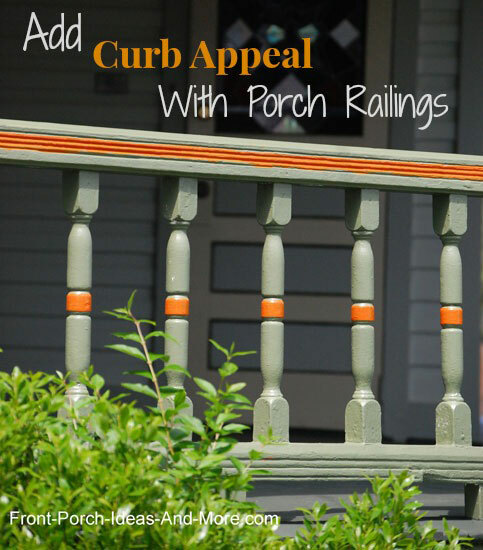 Hope you got some great ideas for your porch railings. They need not be boring. The homeowner added a middle handrail for ease of climbing the stairs. We think aesthetically it looks wonderful. 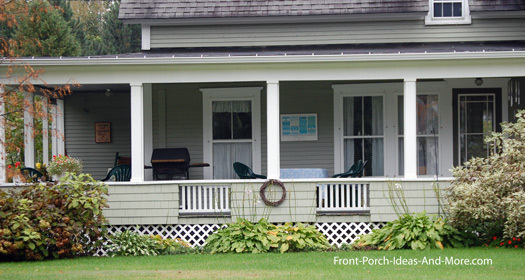 Don't overlook the importance of your porch railings (and porch columns, for that matter). 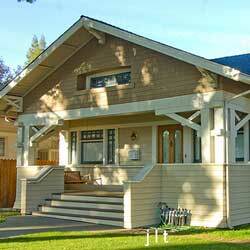 They each provide not only structural functionality but also lend much to your home's curb appeal. 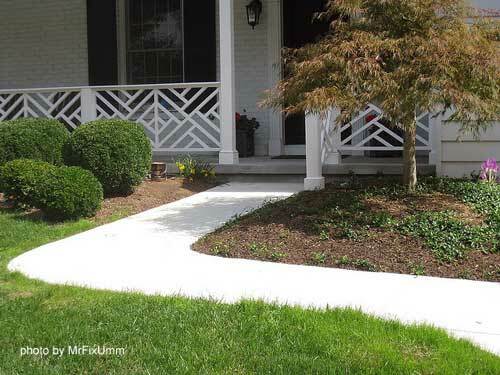 How About Skirting for Your Porch?